I was reading Times of India today morning, and the Front Quarter page Advertisement caught my eye. It was an advertisement for Flair pens. Boldly they advertised – “World’s Longest writing Pen” with a small *star* in the end. I was curious to know how they found out about the “longest” part and expected some kind of survey / study / research. But to my surprise, the star legend told me something that made me laugh – followed by some amount of anger. Here is the reason why. “Probably the Longest Writing Gel Pen & Ball Pen in the world”. It essentially means that there is absolutely no truth in what they have advertised. They have not bothered to check, neither have they confirmed it from any independent study. Think again – they have in BIG bold put it as the World’s Longest writing pen and then they have added “probably” in tiny winy letters. This is just an example, but most of the today’s ads are on similar lines. They claim something that is not true and mask it with fine letters ! Who is responsible for such idiotic Ads? The client, The Ad agency or the newspaper that is publishing it? Yahoo’s Hadoop cluster lab at IIT Bombay: a win-win industry-academia collaboration? Unfortunately Darwinist theory of evolution has failed for humans . We haven’t really become more intelligent over time as a result of stupid sections declining by natural selection , instead we have become more stupid . The answer is simple. It’s the people, the target audience that is responsible for such ads. Because there are enough gullible people to take the bait and make it a profitable venture. So, what do we, who see through this lie, do? Protect the innocent by making laws and put in place filters at every level of advertising and make the whole thing cumbersome enough to deter any newcomer from even thinking about it as a profession? Or, let nature take it’s course, and let the stupid be stupid? Or, are we wise enough to realize that the truth is not something concrete, and that people shall get ripped off every single day till the end of humanity. Nowadays every ad would have ‘starting from’ for prices and ‘up to’ for benefits. Fed up of this ‘up to’ and ‘starting from’ marketing. You are right that advertisements influence our decision to buy or not. But in the world of commerce everything is amoral. It is established maxim in mercantile law that the buyer should beware before parting with money to buy a spurious product and not to be influenced by loud advertisements. When such loud advertisements go out of the way there is a industry watchdog body called, ‘Advertising Standards Council of India’ which censures the advertiser, producer and the advertising channel if any of us readers find the communication to be unfair and wrongful. I am not sure if you have got the message. It is not just about this “pen” AD. This is just an example to show how Advertisers take advantage of consumers by using fine print – and hence the title. This is to demonstrate how ridiculous claims are made to mis-direct public. Although, this ad is about just a pen and wouldn’t hurt anyone much, there are may products that are advertised wrongly and can harm customers to a large extent ! If its not “just about a pen” then why don’t you give some more instances which you are significant. There are so many incidents about health care products such as fairness creams, hair oils, etc. that fail to meet their claims. If you wanted this thing to be taken seriously, then you mustshould have given an example of that magnitude. Who bothers for a pen? What damage does it cause if the pen is not the longest writing pen? For example: Let us take those ads of Dandruff removal shampoos. All of them claim that “Dandruff is cured by our shampoo and it never appears again”. The truth – you may know already. Are you just being righteous for the sake of it ? We all know the most (if not every) ad has some bold claims with a asterisk. Several just say “Terms and Conditions Apply” without specifying what those are. Is the consumer “really” looking for World’s longest writing Pen ? 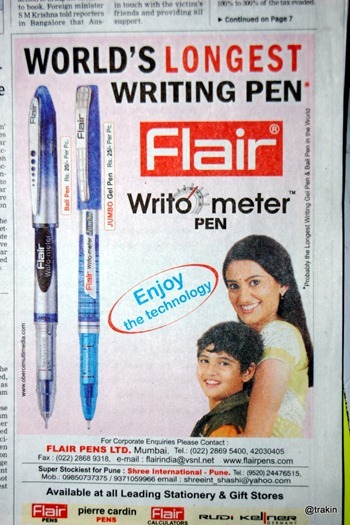 If “Flair” wasn’t – as the Ad itself suggests – would consumer NOT buy the pen ? I generally understand the point – This kind of false information is more harmful in case of medicines or other such products. But for a Pen, how does this matter ? To answer your question : I think it should be the client whose product is being sold. Ad agency and newspapers are just paid for their services. The reason “seemingly important” information appears in small sized text near a star is because it covers the client/ad agency in court of law – In that sense they did NOT falsify the information. So the consumer who really needs “Worlds longest writing pen” won’t buy Flair since it eventually did say “probably”. 1. Either don’t need “Worlds’ longest writing pen” – in which case they aren’t fooled. 3. Is stupid enough NOT to read the asterisk – So again blame the consumer for ill-informed decision. This is a good ad in itself :).. does it safeguards our interests, Arun :D…. hahahaha….I contemplated before I approved that comment…He has atleast put one or two lines at start which may be relevant to the post and hence I approved it..
thanks for giving such a good knowledge .i also read this ads today morning but did not care. I think it is the Marketing Agency that is promoting the Pen the defaulter. As it is clearly mentioned as there is no authentic confirmation about the claims, they are cheating people in open. And as far as i knw, the Writo Meter pen has been advertised in the same way since past 4-5 years. You can’t blame the advertising agency because they (most likely) deliver what the client (company) asked for. The blame lies squarely on the company for misleading the public without validating the claim. The government could vet the ads if there are complaints received after the ad is published and immediately look into it. However there are probably thousands of ads in different media created everyday and so it’s impractical for the govt. to vet them before hand. Censorship is a dangerous thing…It is a monster that better stay bottled up…misleading ads, though not desirable have to be preferred over censorship..
Arun, though I agree that the print media could its bit of screening, I don’t think the media can take responsibility for the content of the ad. The question then would be open to all forms of media including print, radio, TV, internet etc. If we talk about internet, can Google verify or vouch for the accuracy of the claims being made by ads on its network? If in any media Nirma claims that if you use their detergent, then your (white) clothes will be the whitest in the world or if Pantaloon claims that its garments are of superior Japanese quality, should the media company ask Nirma or Pantaloon to provide an independent certificate or report to validate its claims? I think, it is a matter of bringing the ad to the attention of consumer court or responsible agencies to the advertisement. The courts or responsible agencies should take appropriate actions that will dissuade companies from making false claims. In addition, there can be guidelines provided to media houses on certain level of due-diligence they should perform before publishing ads. It is actually a very interesting discussion – To be honest, all 3 involved parties are responsible for it. The buck starts with the company (as they want to mis-guide the customers into thinking they have worlds longest writing pen), the ad agency because they agree with it and offcourse did not any better ideas to promote rather than resorting to such tactics, and lastly TOI for not doing its bit to filter out such Ads. I am not sure if you know, but with Google Adsense, google is held responsible if there is an Ad that does not comply with local government rules. There are many cases files against Google for this and hence they have put millions to filter out such ads. I think its much easier for TOI to do the same ! I’d say the immediate responsibility lies with the reader. Since you mentioned this issue here, may be someone would file a case against them in consumer forum (some day). For which the chances are very bleak. And hence this whole issue will become meaningless in some time. Because the Govt would say, why should we care if no one from several million readers do? TOI is happy as its an ad above all and yeah Advertisers are the happiest. Arun, good to know about Google monitoring its ads. I knew that big G monitors infringement of copyright, brand etc but not about claims as the ‘world’s xyz’. I go with the COMPANY how can dey publish such ads in such news papers.They believe that customers only read the tag line and not other stuff.. It just a petty tactic. I have seen such petty tactics in ads of coaching classes only. Basically, they mention something like “1st in …..”. The “1st” is written is large sized fonts and “in…..” in micro sized fonts. Many times, the student is first in his local college or class batch. I have seen things like “1st in our class in OBC category”. This is so awful. Anyways, it is the consumer’s duty to read all the matter. Thank god that the ad content is only few lines, unlike insurance policies and investment products where “offer documents” are composed of 10 pages of very small size fonts. Such products are the most commonly mis-sold ones. as per my knowlege the compnay has tried to make the fool to people that all company are doing in other way . so its not wrong the difference is that the add clicked into the mind of the people and come into publicity that the company really want to do. I Go with Client(COMPANY), he is the who briefs the agencies and media planners on communication and reach.He is the one who approves it. my vote goes to news paper who s publishing it!! They should atleast confirm what is being published..
ad agencies are made for finding these loopholes only!! Every 2nd day they come up with something new that fools customers, and that’s their job.. We cant blame them!!! Is verifying ad matter the primary responsibility of the newspaper? In times where revenues and margins are under tight pressure, why would one want to loose such a big sized ad? And anyways, they have mentioned the astriek. I tend to disagree with you…I am inclined to think that this is TOI’s responsibility as well, as it is the medium that showcasing wrongfulness. TOI is responsible for the editorial content of the paper and not what appears as an ad in it. The Company and the ad agency too know what they are doing. The customer is no fool (barring some). If newspapers stop publishing every ad that seems to make exaggerated claims they will soon be out of business. If there is no paper there is no reputation to guard. Ok, so if there was some name of study, say for ex “Boston Writing Study 2009”, would you expect the news papers to examine the ‘Boston Writing Study 2009’ and take a call on whether it was fair or rigged? Numerous studies are rigged to favor the “sponsor”.